Organized as an agro-industrial Jewish cooperative community by the Provisional Commission for Jewish Farm Settlements in the United States, led by Benjamin Brown (1885-1939), Jersey Homesteads was one of approximately 100 communities built by the Roosevelt Administration in the 1930's. Among the other members of the Provisional commission were Rabbi Stephan Wise and Albert Einstein. The design of the community, with interior and exterior greenbelts, reflects the influence of Sir Ebenezer Howard, pioneer of the English "garden city" planning concept, while the design of the buildings by architects Alfred Kastner and Louis Kahn incorporates principles developed by Walter Gropius and the Bauhaus in Germany in the 1920's. Jersey Homestead was settled beginning in 1936 and was incorporated as a borough in 1937. Its name was changed to Roosevelt in 1945 in honor of the recently deceased president to whom the community owes its founding. 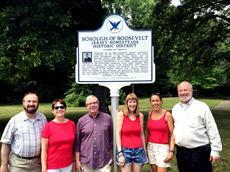 Roosevelt has been home to many prominent artists, including Ben Shahn, who painted a mural in the elementary school depicting scenes of Jewish immigration to America, the garment industry, the labor movement, and the organization of Jersey Homesteads as a planned community for working people. Click to enlarge - Benjamin Brown, the father of the Jersey Homesteads, 1936.